Sun Valley Animal Center pet boarding includes the Pet Lodge and the new Pet Ranch, as well as Doggie Daycare. We offer hikes, walks, baths, and pet taxi. Sun Valley Animal Center Pet Lodge pick up and drop off hours are Monday through Friday from 8:00 AM to 6:00 PM as well as Saturday and Sunday from 9:00 AM to 5:00 PM. Please call 208-622-PETS (7387) to make a reservation. The Sun Valley Animal Center offers a wide variety of dog boarding options to meet your pets needs. Please feel free to speak with one of our Animal Care Specialists to help you decide which option is best for you and your pet. Sun Valley Animal Center Pet Ranch: Sun Valley Animal Center offers luxurious cage-free, in-home pet boarding at The Sun Valley Pet Ranch. Please call the Sun Valley Animal Center Pet Lodge Reception Desk for more information or to make a reservation. 208-622 7387 (PETS). Sun Valley Animal Center Pet Lodge: At the Pet Lodge, dogs are let out of their enclosures a minimum of four times a day, for at least 20 minutes each time, depending on the weather. We have five large yards with summer swimming pools in three of these yards. Dogs are placed in playgroups depending on their size, age, temperament, and ability to socialize. If your dog is staying in a Condo or Suite at the Pet Lodge, there is a good chance that your dog will spend most of the day in our playrooms with a dog play group. If your dog is in one of our runs, there should be lots of interaction with our team of Animal Care Specialists. Please inquire about our dog hike options and request a bath at the end of your dog’s stay at the Pet Ranch or Pet Lodge. We require reservations for overnight visits. Please bring a current copy of your pet’s vaccination records. There is a 12 pm check out for pet boarding. A half-day day care charge will be added for late pick ups. Pets checking in prior to 1 pm may be charged a half-day day care charge depending on availability. There is a 15% discount for multiple pets staying together. There is a 10% discount for visits 14 nights or longer. We have beds and blankets for everyone. If your dog or cat has a special attachment to something, please bring it and make sure it is labeled appropriately. Please keep in mind that we cannot always guarantee that the item will be returned in the same shape. We serve Iams, Eukanuba, and Science Diet. If your pet eats something else, we can either feed him Eukanuba Lo-Residue for dogs or Iams maintenance for cats. Please do not bring dishes. You are welcome to bring your pet’s regular food. We hope to minimize change in your pet’s routine as much as possible to avoid stress. Please let us know how much and how often to feed your pet. If your pet is on medication, please remember to bring it with you. Please include detailed instructions about how much and when to administer this medication. Please make sure all containers are properly labeled. We do not charge for most medications dispensed, however, there are a few exceptions. We cannot accept pets that are not vaccinated. If there has been an overlap in vaccinations due, we recommend making a vaccination appointment with one of our doctors at least two weeks before your visit. This will minimize stress in your pet during check-in day. If this is not possible, we can vaccinate upon your arrival. Dog Vaccination Requirements: DAP, Bordetella, Lepto & Rabies. Combine the 2 discounts when multiple pets stay together 14 nights or longer. There is a noon check out for pet boarding. A half-day day care charge of $13.50 will be added for late pick ups. Pets checking in prior to 1pm may be charged a half-day day care charge of $13.50, depending on availability. 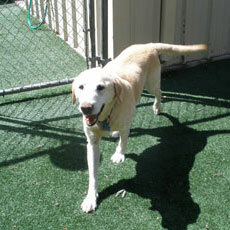 The Pet Ranch at Sun Valley Animal Center is an exclusive cage free dog boarding experience. An Animal Care Specialist is in residence 24 hours a day, 7 days a week. The Pet Ranch is a home where 1 -10 boarding guests are allowed to roam freely in the spacious living room and beautiful back yard. Meals are individually served in the separated kitchen area. Your dog will be offered cuddle time and daily brushings. There is a secondary back yard big enough for fetch and swimming in the beach front entry pond. Dog moms and dads can check in on their “kids” through designated web cam links any time. A report card is emailed daily to the families of our guests. Your dog must be either a neutered male or a female not in heat with proof of current vaccinations. 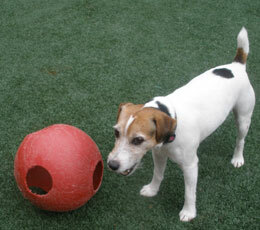 If your dog has visited our boarding facility before, they must be comfortable in our social play groups. If you live in town, but are new to our boarding facility, we will require 1 half day of daycare before determining your dogs’ eligibility for cage-free boarding at Sun Valley Animal Center. If you are a guest in our resort town and would like to leave your dogs at the Sun Valley Animal Center’s Cage-Free Boarding, we will require a letter of good recommendation from your regular daycare or cage-free boarding facility prior to your visit. The management and staff of the Sun Valley Animal Center do reserve the right to remove any dog who poses a threat to himself or others from the cage-free environment. Any dog removed will be boarded in a safer environment more suited to that dog’s personality at the Pet Lodge. Please do not bring personal belongings other than food. Sun Valley Animal Center will provide beds, toys and bowls for your convenience. Personal belongings may create a territorial environment and not allow for the dogs to feel comfortable in our neutral home environment. Boarding check-ins must be by 5 pm, unless prior arrangements have been made. Check-out times must be scheduled at the boarding desk prior to departure.